After a weekend of incredible conditions in Sydney and down the coast that were blessed by NE winds, blue skies and +30c temps we’ve had the mother of all Southerlies come through Sydney and smash us!! I managed to arrive home from down south just as the big dark storm clouds rolled in and the wind died from being a ~12knot NE to what appears to be a 45knot+ Southerly with lightning and rain! I did see 2 kites ready on the beach down at longy, I hope they were small and I’m taking a punt that one of them was Barber Shop Ben as I stole one of his pictures from Facebook :). Pretty insane stuff, hope everyone stayed safe and didn’t do anything stupid. Below are a few shots I snapped when the storm first hit in Dee Why. Sunday, was it that great? So guys, I called it on Sunday at about 11am. The swell was PUMPING and it is very rare to get such a big wave coming into Fishermans. 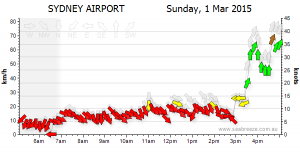 Unfortunately even though it was windy enough to kite it wasn’t really windy enough to get stuck into that big swell and mother nature didn’t want to line up any good wind and waves to make them easy to surf on with a kite! So, what was it like, well the photo here shows Jono heading out as chief tester of the conditions, there was a lot of water moving in the small bay but he seemed ok and managed to get out to white rock with little hassle, that little wave there on the corner of the reef at the launch site was jacking up to a good 4ft when we got there and proved a little troublesome for a few. (This opens up a few topics on conversation that I’ll talk about later) Chris in the foreground here was rigging up a 2045 model kite made of carbon nano-tubes and layered graphene sheets. He was excited at the prospect of big waves and light winds that always equal carnage. After Jono had about 10mins under his belt without dying we decided it was probably OK to head out, so off we go, I headed pretty much straight out to Macaha to check it out, there is a LOT of water moving out here and the open ocean swell is like riding over houses. The set that I witnessed rolling in was like something from a movie, 3 8-10ft+ sets peeling right with glassy faces! I’ll be honest, 15konts on a 9m with that kind of movement didn’t sounds so flash so I hung about a bit and decided that dying today wasn’t the best idea so headed back into the bay to see if any of those waves were kitable. White Rock was too downwind and fat and the only thing that was nearly doable was the brown wave at the launch exit. For a while there it was great, 3-4 of us out, no one in the way, every one was having a great time doing circuits to have a crack at a wave. Then it happened! The CROWDS!! I’m all for everyone kiting at Fishermans, I love the buzz on the beach but there are times when an assessment has to be made. If you are going to just mow the lawn and cruise back and forth in a line please do so NOT IN FRONT OF THE ONLY WAVE THAT PEOPLE ARE TRYING TO KITE ON. Fishermans is a great spot, it is a much better launch and go somewhere else spot than anything else. It also can be a bloody a dangerous one that doesn’t support many kiters safely. I’m not sure if in lessons these days they teach about looking for dangers but has everyone noticed the rock, trees, power lines, golf club, million $$ houses, boat ramp, flag pole, hang gliders, small beach etc etc. Sitting on the beach just highlights how many close calls there are and they are all totally unavoidable if people look ahead, look before they turn and watch what others are doing. I heard a few people say that they weren’t too keen or good enough to get out past the wave and out to the left where there is better wind and less people. So everyone just ends up on top of each other. 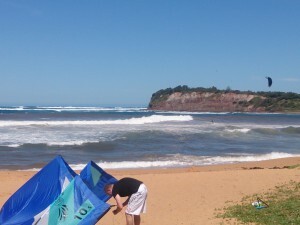 Recent events at Long Reef have highlighted to us the dangers and it has to stop if we want to continue to kite here. It isn’t just Fishermans, it is everywhere from Botany to longy, people mowing the lawn and just going in and out all on top of each other when there is a whole ocean to use. Please guys, spread out. Launch, head upwind and find your own space, if you see people surfing waves and you are not just move away. If you are practicing jumps and rotations you need to plan for the fact you may loop the kite and end up way downwind etc etc. Anyway, enough of that rant for today! Yesterday was good, it didn’t line up as good as it could have but there will be another day, like today maybe! It was really humid outside this morning and that may inhibit todays wind, the forecast is really north so lets hope it holds up. If it’s real North the options are slim, most places could be too gusty and with good a swell still going there could be a few kite repairs this week. Another highlight of the day for me was someone asking if I was Pete from the website! for this sir you get a special mention! Sorry I’m really bad with names but thanks for the chat, it was great to see you out in the best spot cruising about all on your own trouble free away from crowds. When I make some stickers you’ll get one for free.